Don't worry about things getting to warm because there is also a pretty pink oven glove. This set contains 7 pieces. Frying pan, complete with wooden frying egg. The oven glove is a lovely touch and really brings to life those pretend kitchen games. 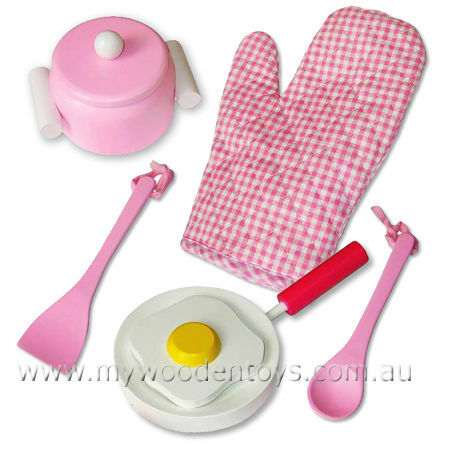 Size: The Fry pan has a 12.5cm diameter and a 9cm long handle. The the Pot has a 10cm diameter and is 6.5cm deep. The utensils are 16cm long. The egg is 10cm by 10cm. The Oven Glove is 17cm long and 15cm across. Material: Wood childsafe paint. Cotton and nylon oven glove. We like this because: "Our daughter asked why the egg wasn't pink as well. "